Cat Chat With Caren And Cody: CatLadyBox Made Me Purr! Give-Away!! 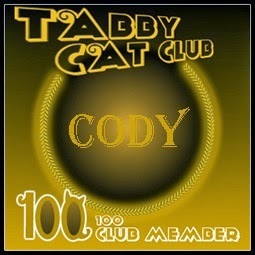 CatLadyBox Made Me Purr! Give-Away!! Let me begin this post by saying that when it comes to monthly subscription boxes for cats, I am NOT a fan. Why? Because the market is saturated with them, and the novelty wore off for me nearly the instant they came on the scene. But...a monthly subscription box created exclusively for the tasteful and oh so savvy Cat Lady? Now we're talkin'!! When I first heard about the CatLadyBox my ears perked up! Now THIS I had to see! 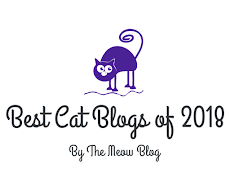 Created by Dorian Wagner, one of the most power-packed, adorable, clever, caring and talented cat ladies that I have had the pleasure of knowing since I first began blogging in 2009. I had the pleasure of meeting her at my first BlogPaws Conference in 2011 and our paths have crossed a number of times since. Just KNOWING she created this treat for cat loving ladies, I KNEW it would be a hit...AND IT IS. I first learned of Dorian when I followed her blog, Your Daily Cute , a blog dedicated to cute cat videos. It was one that was always on my "must read list." Dorian also created the popular and hugely successful Santa Paws Drive which takes place every holiday season and provides monetary and toy/spay neuter and supply/treat donations to deserving shelter cats all over the land! 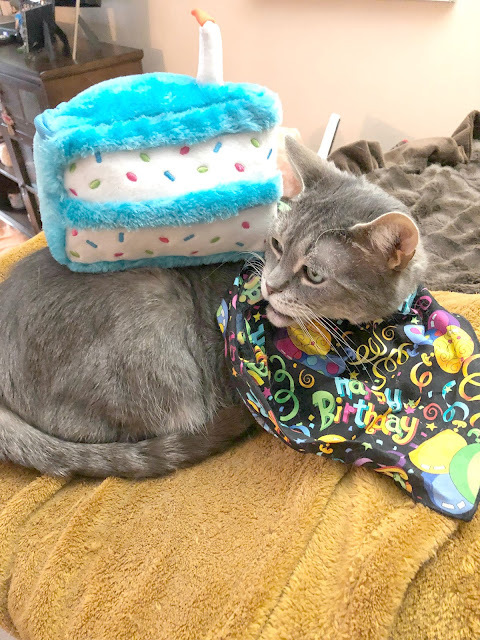 Not one to rest on her laurels, Dorian went on to create and execute a brilliant pet transport group, Cute Transport Network, which helped shuttle many cats, to new forever homes and no-kill shelters. Over 400 cats have been saved!! When I was given the honor/opportunity to blog about the August Crazy CatLadyBox, I could barely contain my excitement. (The Crazy CatLadyBox is one of two boxes that you can choose from). The CRAZY CatLadyBox ($39.99) includes crazy cat lady items hand-picked for you PLUS at least 2 surprises just for kitties! Everyone gets in on the fun! In the regular CatLadyBox ($34.99) you'll receive 2-3 cat-themed items carefully handpicked by a team of crazy cat ladies just for you! From jewelry and shirts to home decor, books, mugs and more, these are unique things you won't find in any regular store. From the moment the box arrived at my doorstep I noticed the special touches and attention to detail that are oh-so Dorian!!! From the sticker on the box, to the hand-written heart shaped note on the letter that describes all of the contents in the box in explicit detail, and how the subscription program works, this box did NOT disappoint. What I didn't realize until I read the letter, was that if receiving a box every month is not your "thang", you CAN skip a month! Why you would want to, is beyond me, but if you need to, YOU CAN! You can upgrade, downgrade, change billing, shipping, shirt size etc., all from the account section of the site. Subscribe to CatLadyBox and each month they will surprise you with a box of unique finds for cat lovers, exclusive members-only cat lady items and cat-themed creations you'll be proud to flaunt! There is nothing obnoxious or "tacky" in this box! Every single month, they will hand-select a fabulous assortment of high-quality cat-themed jewelry, stylish accessories, stylish home or office decor, makeup, books, glassware, and more, and deliver them right to your door (free shipping in the U.S. and only $6.95 to Canada!). It's like getting the most purrfect presents, over and over again! Now...What was in my August Crazy CatLadyBox? 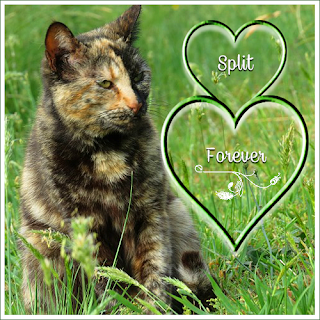 A beautiful card by featured Cat Lady Artist:Ablaze in Color. You can find her at local art festivals, on Etsy and on Facebook. The Cat Print Scarf and Refined Feline Wallet by Triple T Studios. We featured Triple T Studios a few months ago. It was founded by zoologist Joanne McGonagle to support global conservation programs. 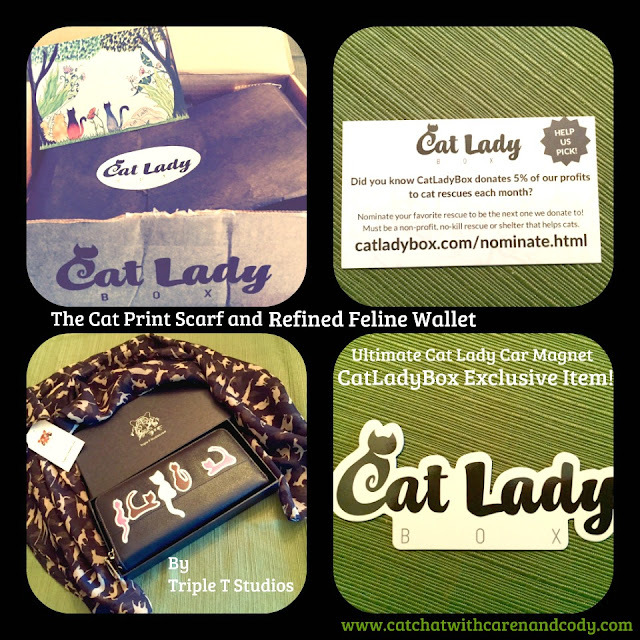 Ultimate Cat Lady Car Magnet-a CatLadyBox Exclusive Item! Show your Cat Lady pride on the road or you can put it on your fridge! There were items for Cody too!! 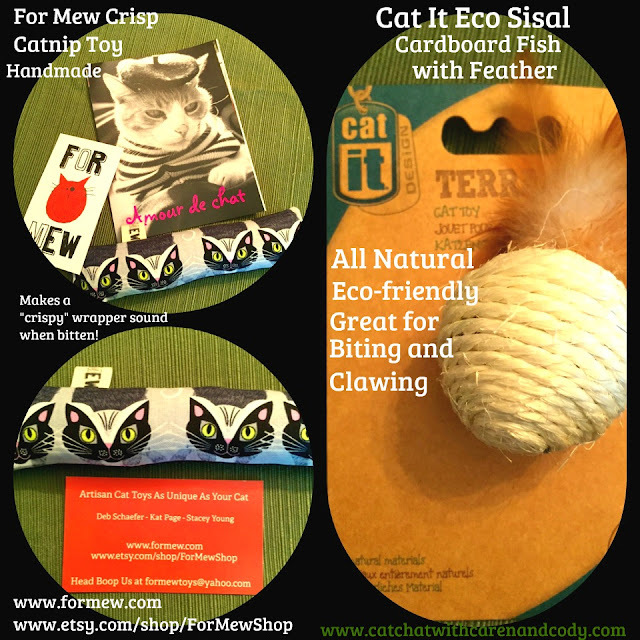 For Mew Crisp-"Artisan Cat Toys As Unique As Your Cat"
The CatLadyBox would make a SUPERB and MOST APPRECIATED gift for your Cat Lady friends and relatives! You can choose "Give a Gift" on the homepage and gift anywhere from a 1-to a 6-month subscription. The site only charges one month at a time, CatLadyBox will send an email saying YOU gave them the gift and you can even pick the day they send the email! Could it be ANY easier?! I don't think so! The CRAZY CatLadyBox includes all of the crazy cat lady items hand-picked for you PLUS at least 2 surprises just for kitties! Everyone gets in on the fun! (The items you will receive will be different than the items I have shown above.) Entering is EASY, just enter on the Rafflecopter below, THERE IS ONE MANDATORY ENTRY, once you have completed that, it will open up BONUS entries!!!! GOOD LUCK!!! Our mission is to change the way people think about cat lovers and cat parents. We are not that one extreme person they see on the news every now and then. We are beautiful, intelligent, fun, successful, big-hearted, respect-worthy women... who love cats. Saving cats is something we've always been passionate about, and we want to help save even more lives. So the goal at CatLadyBox is to find unique, envy-worthy cat-themed items to help you show off your cat lady pride, show off just how many of us there are, how fabulous we are, and how amazing we think cats are. Together, we can make a huge difference for cats, one new cat lady (and cat guy) at a time! FTC DISCLOSURE: I was sent a complimentary August Crazy CatLadyBox in exchange for my honest review. Receiving the complimentary box in no way influenced my opinion. Cat Chat With Caren and Cody only shares information we feel is relevant to our readers. I'm no lady, but I entered anyway! Same here!! Cat guys need boxes of stuff too!! Wow, awesome stuff! Fingers crossed! We love the Cat Lady Box too - we got July and were so happy with all the contents! And you are so right about the attention to detail. I've seen these around the blogs and it looks like one of the "classiest" cat goodie boxes there is out there AND the best part is it contains stuff for humans AND their cats! Aw, thank you, Sammy! We love being a little classy and fabulous, and I'm so happy you can tell! :) I hope you'll get to try us out one day! WOW, what a cool box of surprises. I so like the idea of both woman and cat receiving something. I especially like that you're not bound each month and can make changes if you need to. Really sweet. Hi Barbarella! We do ship to the UK now and we'll be adding more countries soon. Where do you live? The mom had the opportunity to review the July box and totally agrees with you, Miss Caren. Miss Dorian has a winner here! And a CatLadyBox would make a great gift too! Yep!! I mentioned that above that the holidays are approaching! And what about birthdays, graduations, etc, etc throughout the year? I thought of another good point with these boxes.........not EVERY ITEM IN EVERY BOX is going to appeal to us every month........or be suitable....BUT....when a person subscribes they have an INSTANT GIFT for someone else if they don't use the item!! They paid for it so it isn't "re-gifting." 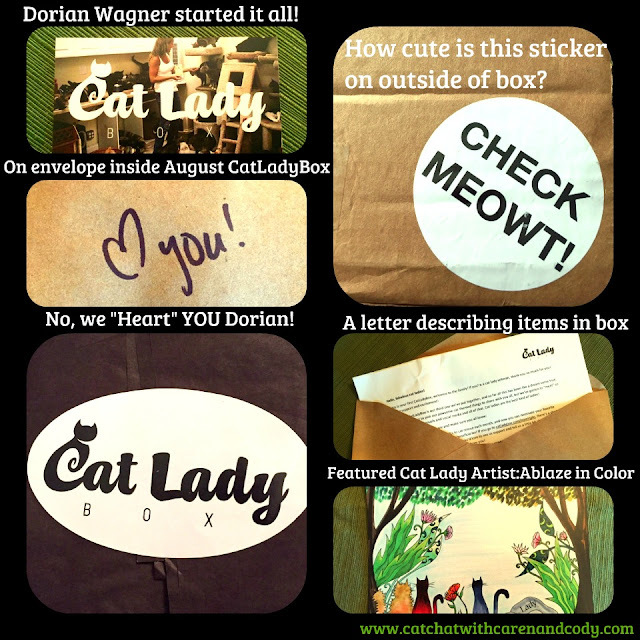 Miss Dorian's Cat Lady Box is the best ever subscription box out there! You can tell she really knows Cat Ladies! Awwwww! Thank you all! <3 Meow! Cool! We've been curious about these boxes! Those boxes sound really terrific. What a good idea. And great review Cody. Even you got some nice stuff. Have a great day. They are a SUPER idea! Thanks so much!! I helped Mom work on it! Love, Cody Oh and you have a great day too! Whoa! The August box is waaaaaayyyyyyy better than the July box I received which had a tshirt and some cheap carp that wasn’t worth $34. You totally lucked out and so did Cody. It’s a good thing I didn’t review it or I would have said as much. Believe it or not, TW used to get monthly makeup boxes when she was young and the cost of the items enclosed were usually ten times more than the cost of the box. I wonder why I couldn’t log in using FB. It’s always worked before. CK, you are entitled to your opinion but I couldn't disagree more. First, it is not "cheap carp". As with any monthly subscription box (I don't care who or what it is), there are going to be items that vary in price every month. I have been keeping a close eye on EVERYONE'S reviews who have received earlier boxes and ALL of them looked fantastic. I plan on subscribing and gifting the boxes soon. If you wanted I COULD name some monthly subscription CAT boxes that ARE "cheap carp" but I am too classy to do that publicly. We kinda agree with Caren. We reeeaaallly LOVED the fortune cookie (and our mom wears the necklace all the time!) but that's the beauty of these boxes -- each month is different and they all appeal to different types! Our Lucy is insisting we enter! So we are! Have a great day! HEY GUYS!! When I was writing to Rosa above I thought of another good point with these boxes.........not EVERY ITEM IN EVERY BOX is going to appeal to us every month........or be suitable....BUT....when a person subscribes they have an INSTANT GIFT for someone else if they don't use the item!! They paid for it so it isn't "re-gifting." I ADORE the scarf from Triple T Studios, but I have a short neck and large shoulders and scarves don't look good on me (I don't wear them well).........when you order a box you are receiving "surprises" every month!!! If something doesn't "work" for me, that doesn't mean it won't be great for my cat loving "bonus" daughter, a blogger friend, or other cat lovers that I know! When I pay for my subscription (AND I WILL), I will have some gifts at-the-ready that will be PURRFECT for others, when maybe an item or two isn't just right for me. It doesn't make the item any less valuable. Cody has TONS of toys and sometimes I donate or send toys to others with cats........there is definitely more than one way that this subscription box is useful. There is nothing cheap or of inferior quality about it. Dorian put a TON of time and effort into these boxes, she listens to what we LOVE and these boxes are PROOF of that. Getting off of my soapbox now! 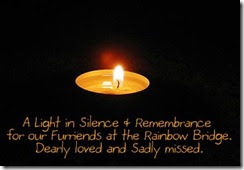 Love to all! What a great giveaway (and a good point about it being an instant gift if you don't like it) these boxes are designed very well and make an excellent presentation. We all have different tastes, so yes, we aren't all going to love what is in every single box, but I bet we can all find someone in our lives who would love something we don't necessarily like.. Thank you Connie! Exactly! "we all have different tastes, so yes, we aren't all going to love what is in every single box".........and you are right! We can all find someone who will! Thank you! I don't have cats. So allergic, but I so love cats. I know I'd have several if I wasn't allergic. Pawsome review!!! Wow what a great idea too from Dorian. Thank you!! And yes about Dorian, that woman has a mind that is ALWAYS thinking!!! OMMC What a pawsum box. 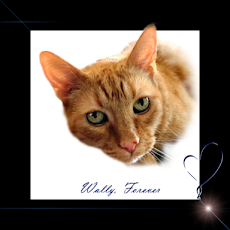 Weez been twyin' to win one fur mommy since da twitter chat. But no such luck. MOL Maybe this time. Enjoy yous goodies, cuz they be weally cool. Have a gweat weekend. We are sure proud of Dorian, she came up with a real winner! We are proud of her too and couldn't agree more! Nice idea. Usually, catbox contain things just for cats. Too bad, I live in France. Cool idea! Especially since there is so much tacky cat stuff out there. So proud of Dorian, she is doing a great job with this. We will give this a chance too!! We don't do twitter or pinterset...so of course it will be even more miraculous of we win,MOL! It looks like a pawsome thing to be won!! Love all the goodies in your CatLadyBox! Great giveaway! One of these first days, the green papers will allow us to subscribe to this wonderful box.